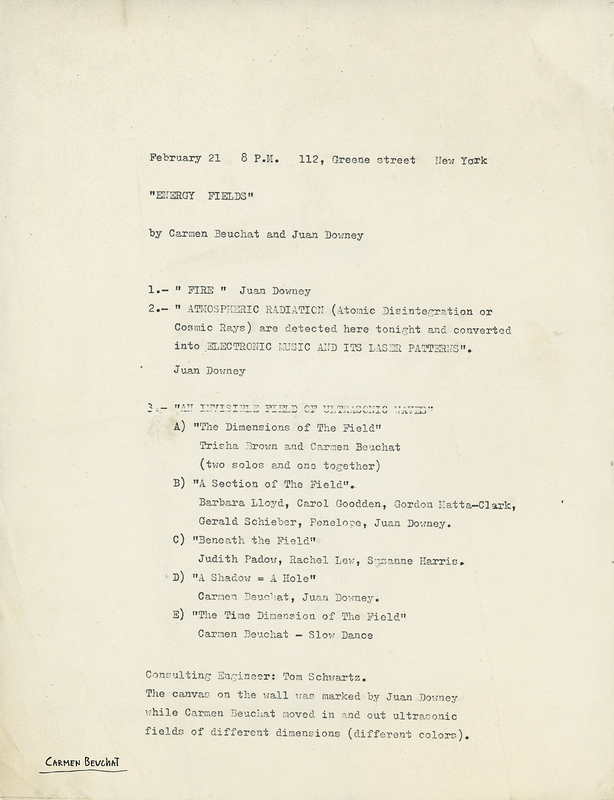 Descriptive program of Carmen Beuchat and Juan Downey´s work “Energy Fields” presented on February 21st, 1972 at112Greene St. Gallery. The creation is composed of different pieces: (1) “Fire” by Juan Downey, (2)”Atmospheric Radiation (Atomic Disintegration or Cosmic Rays) are detected here tonight and converted into Electronic Music and It´s Laser Patterns” by Juan Downey, (3) “An Inivisble Field of Ultrasonic Waves” composed by (a) “The Dimensions of the Field”with Trisha Brown and Carmen Beuchat, (b) “A section of the field” with Barbara Lloyd, Carol Goodden, Gordon Matt-Clark, Gerald Schieber, Penelope and Juan Downey, (c) “Beneath the field” with Judith Padow, Rachel Lew and Suzanne Harris, (d) ” A shadow = A hole” with Carmen Beuchat and Juan Downey and (e) “The time dimension of the fileld” with Carmen Beuchat. Tom Schwartz as assitant engineer.